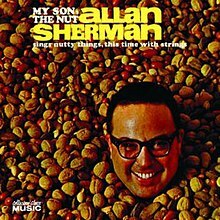 It’s a welcome if rare occurrence when a reporter has a chance to quote material from Allan Sherman’s classic comedy album “My Son the Nut” (Warner Bros. Records, 1963). I recently had the pleasure. This entry was posted in Freelance writer and tagged Allan Sherman, Industrial robotics, material handling by dinahwbrin. Bookmark the permalink.